Your full time schedule to the newest Mission Blue Foundation Hope Spot, begins on the westernmost tip of Cuba in the Peninsula de Guanahacabibes, one of Cuba’s largest protected areas and declared an UNESCO World Biosphere in 1987. This national marine park is at the center of scientific, bilateral agreements. This biosphere reserve of 121,572 hectares of wildlife forestry including 154 square miles of national park and is a story of hope and recovery. Our company is involved in Humanitarian-Environmental projects here in teamwork with the Marine Biologist team headed by Dr. Dorka. It is home to a variety of habitats including coral reefs, mangroves, scrublands, and evergreen forest with more than 170 species of birds and dozens of reptile and mammal species. The coast has the second largest breeding population of green turtles in the country with an average of more than 300 nests per season. A two-hour drive from Pinar del Río, the Guanahacabibes National Park lacks major infrastructure, with Villa Maria la Gorda being the only remote hotel in the national park near to the Marine Biologist team and local villages that our program supports. Our participants experience the inter-dependence of marine ecosystems shared by Cuba and the United States. Through humanitarian environmental exchanges that cultivate meaningful dialogue about ecological conservation efforts and cultural, socio-economic ties, we can all gain better empathy & understanding in caring for our environment. 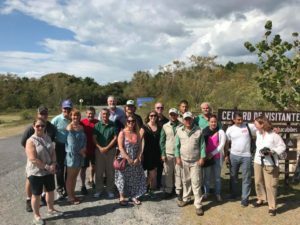 NOAA, the U.S. National Park Service and Cuba’s National Center for Protected Areas agreed to share research to help the countries work together on some of the Caribbean’s most ecologically significant resources. 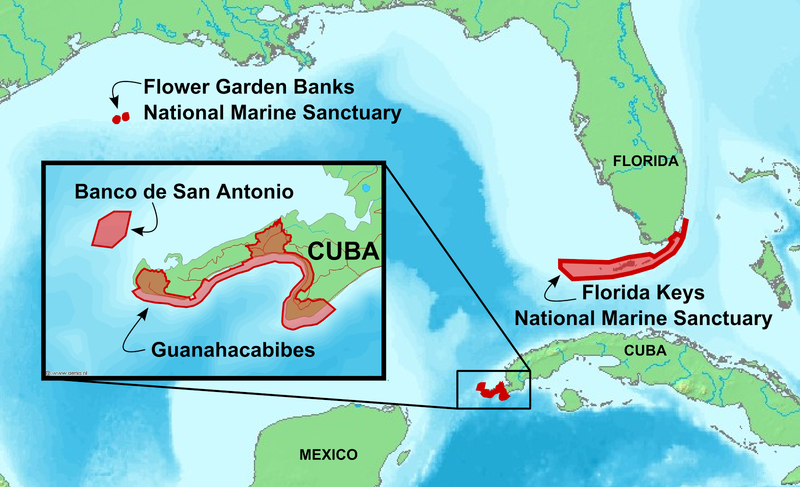 The countries focus on five sensitive international environmental areas–Cuba’s Guanahacabibes National Park, including its offshore coral reefs at Banco de San Antonio; NOAA’s Flower Garden Banks and Florida Keys national marine sanctuaries; and the Park Service’s Dry Tortugas and Biscayne national parks. The agreement helps both countries improve decisions about the management of the larger marine ecosystem. The Tampa Bay Aquarium and Cuba’s National Aquarium in Havana have also collaborated in the Guanahacabibes Peninsula to plant a new coral nursery. 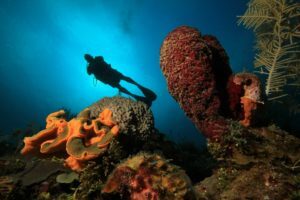 More than half the Caribbean’s coral reefs, home to more than 4,000 species of fish and countless species of plants, have died since 1970, according to the Global Coral Reef Monitoring Network. Yet, Cuba’s conservation efforts in Guanahacabibes National Marine Park have allowed the coral system to remain healthy and vibrant in contrast to the critical condition of the rest of the Caribbean. 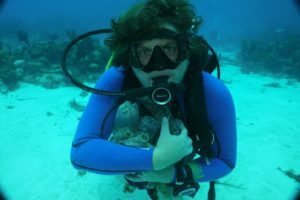 Marine Biologists say protecting Cuba’s marine resources is critical to ensuring the health of the United State’s reefs and fisheries — all the way up to Massachusetts and as far west as Texas. 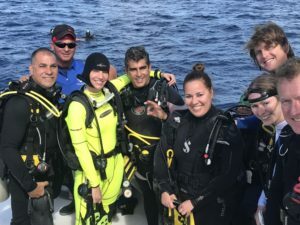 Through presentations and aquatic immersions led by head Cuban Marine Biologist, Dr. Dorka Cobián Rojas, and her biolgy team, Participants learn about the life history and ecology of coral species, and the threats to coral health in the Caribbean and globally. 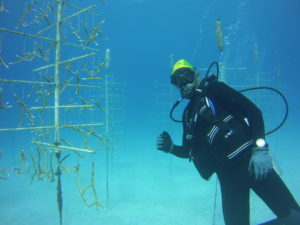 During aquatic immersions, participants learn to identify prominent coral species and participate in maintenance of the staghorn (Acropora cervicornis) coral nursery. Participants receive instruction by local Cuban marine professionals detailing the life history traits of lionfish (Pterois volitans)that make them such successful invaders, the impact that they have on the ecosystem, and why action needs to be taken to remove them. Participants are tutored on how to safely remove lionfish from Guanahacabibes National Marine Park. Participants will then get the opportunity to sample lionfish from the menu. 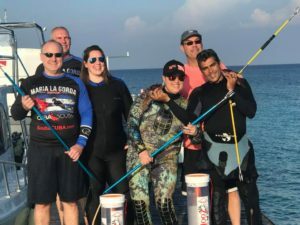 This project works directly with local privately owned village restaurants to get lionfish on the menu and out of the ecosystem. 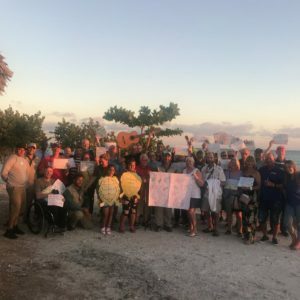 The aim of this program is to raise awareness about the impact of plastic pollution, to influence social change by encouraging participants to avoid single use plastics and to actively remove plastics from dive sites and beaches in Guanahacabibes National Marine Park along side local Cuban villages. In excess of 8 million metric tons of plastic ends up in the ocean annually. Millions of animals, including marine mammals, reptiles, birds and fish are killed through entanglement, ingestion or are poisoned by plastic debris each year. 44 % of all seabird species, 22% of cetaceans, all sea turtle species and an ever-growing list of fish species have been documented with plastic in or around their bodies. Over half of the plastic we use is single-use, plastic enters our ocean through littering, poor disposal and down the drain (microbeads and microfibres). Participants are given a presentation about plastic debris and actively engage in collecting plastic debris from marine sites in Maria La Gorda and direct support for Cuban people in this joint community coastal clean up. 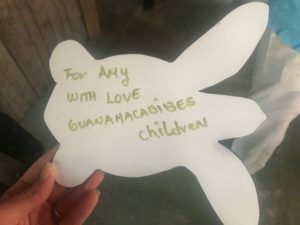 Guanahacabibes is home to the second largest breeding population of green turtles in the country with an average of more than 300 nests per season from April – October. The Guanahacabibes Marine Biologist team, University of Havana’s Center for Marine Research & CubaMar monitor the ecology of these nests. Prior to this work, there was no intensive monitoring of sea turtles in this region of Cuba. The project has built strong ties with local schools and residents. With the recruitment of local residents as participants in research, the project has reduced poaching of turtles and their eggs by 80% throughout the national park. The project includes a strong education component to ensure that local communities will carry on this work in the future. Green (Chelonia mydas) and Loggerhead (Caretta caretta) turtles nest on 10 beaches along the south coast, using Guanahacabibes coral reefs as feeding and refuge sites throughout the year. Studies show that 500 – 1000 individuals nest at these sites. This nesting colony is of great importance, not only for Cuba but for the entire Caribbean and globally. 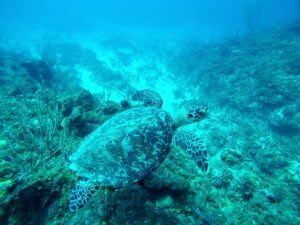 There are 5 genetic variants of green turtles exclusive to Cuba and they are nesting in Guanahacabibes National Marine Park. Participants actively engage in protecting and conserving these turtles by volunteering to assist local marine biologists and community members by locating and monitoring nests, and counting and recording the number of eggs and successful hatchlings. 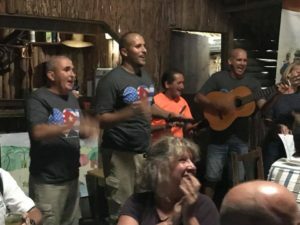 This is a new program that Cuba Scuba is raising humanitarian funds to purchase 30 new bicycles, which will also provide direct revenue to private village residents! Participants engage with the scientific terrestrial and marine biology team of Guanahacabibes to explore the coastal and terrestrial habitats within Guanahacabibes National park and gain an insight into how the local communities and scientific organizations work together to achieve conservation objectives. 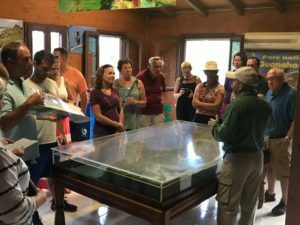 The Cuban biologist tour guide will be able to provide participants with a wealth of information including iguana nesting patterns and crab migrations. Depending on the chosen method of travel, participants will learn about mangrove, cave or forest habitat and the creatures that call them home. Participants will learn about the high number of endemic species present in Cuba. 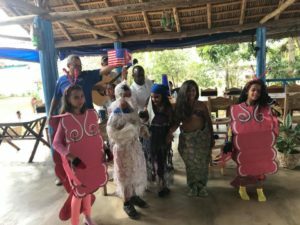 The guides also talk about how the coastal community culture has contributed to conservation efforts in conjunction with La Bajada and surround villages to directly support the Cuban people.